While waiting for the delivery of his first Fez-o-rama fez, Adam P Knave decided take it upon himself to document the travels of one of our notorious Shipping Llamas. 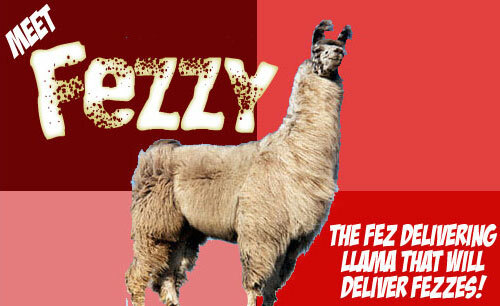 So here is your chance to meet Fezzy the fez delivering llama that will deliver fezzes. Monday, Day 1 – I got new fezzes to deliver! That’s awesome! I like delivering fezzes! Oh, wait… I’m in California and this guy is in NY? Fucker didn’t even spring for good shipping so I have to… wait, “ground”? Seriously? I have to walk to NY? Oh, man, this guy is uncool. Still, I have a job to do and by golly I’m gonna do it! Tuesday, Day 2 – New York seems very far. My legs aren’t that long. I should’ve packed better shoes. And a blanket. The motel wouldn’t let me stay. Something about me being a llama and that breaking a rule, or someshit. They better not order fezzes at that Motel 6, I can tell you that! Learn more of Fezzy’s adventures on AdamPKnave.com The shipping llamas taking a break while we pack up more fezzes.